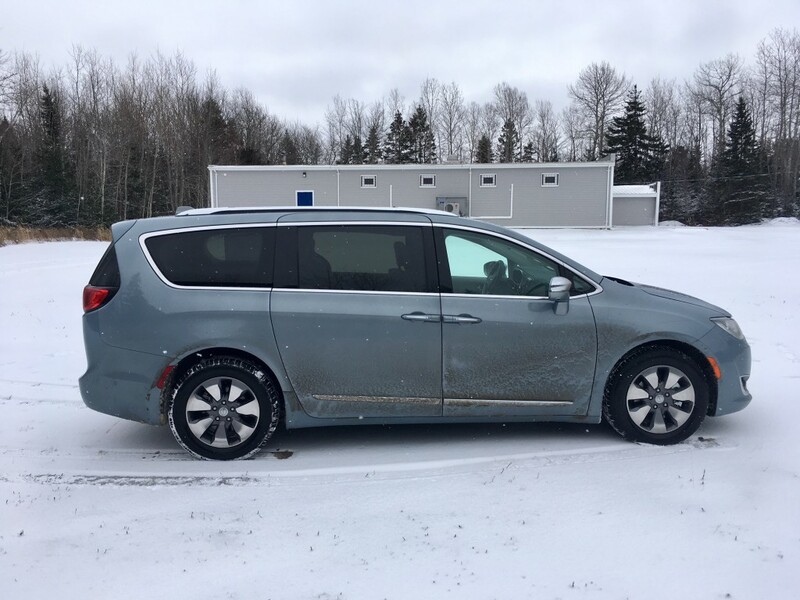 It seemed a long time coming, or at the very least, a bit of an oversight from the entire industry: a plug-in hybrid minivan. Why has it taken so long for a manufacturer to hybridize the minivan? After all, there are hybrid cars, hybrid sports cars, hybrid crossovers and SUVs, and there have even been, at one point in time, hybrid pick-up trucks. Well perhaps a reason why we are only now seeing the first ever hybrid minivan is due to the fact that minivans are about as in demand as the bird flu. 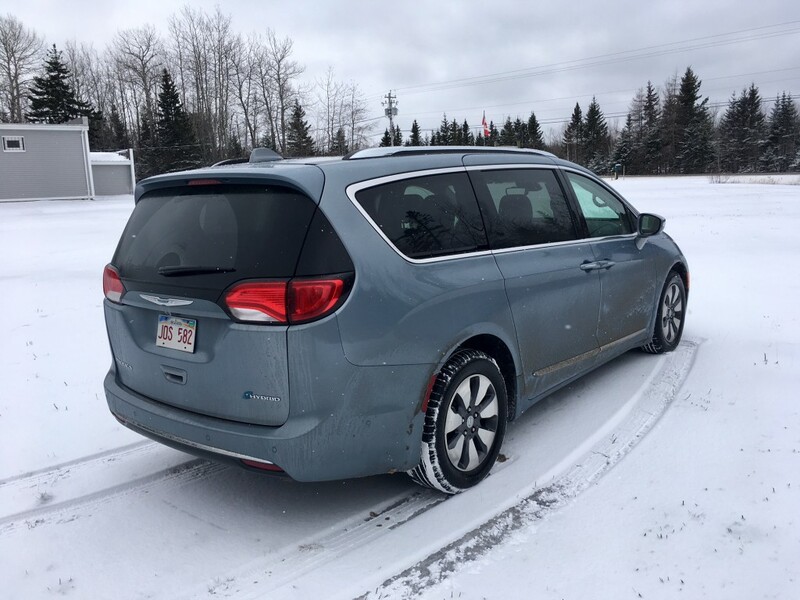 Everyone believes they can have their cake and eat it too with a three row SUV (spoiler: they can’t) and as a result there are now only four minivans to choose from in the entire market. 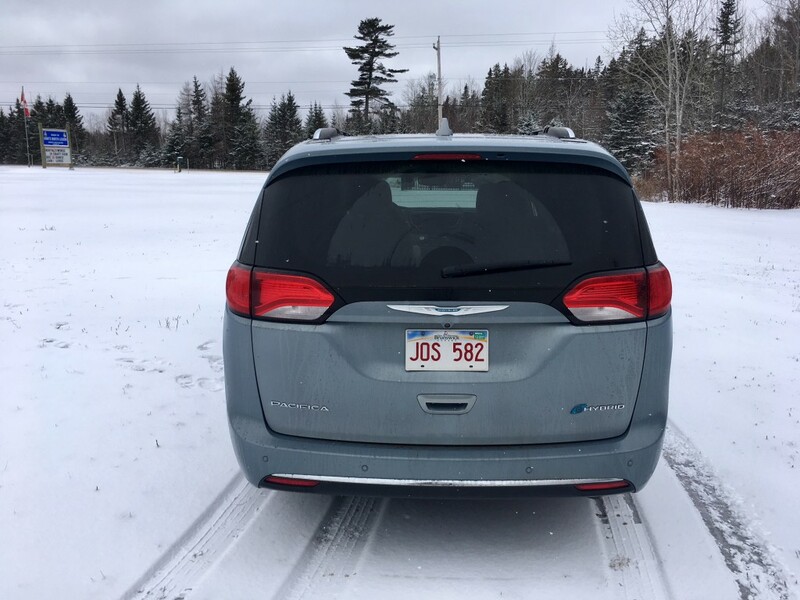 It seems fitting though that Chrysler is the first to the table with a hybrid minivan. They were the first to introduce the segment in the first place way back in 1984. But is it worth investing such technology into a segment that is dwindling? For the sake of seeing what can be done with plug-in technology, I say yes. Besides, there has never been a better looking minivan than the new Pacifica. While the eye-catching style may not be enough to get people out of their SUVs, there’s no denying the Pacifca is a relative looker. Stealing the face of the old 200 sedan was a good idea and its swooping lines make their way across the vehicle. 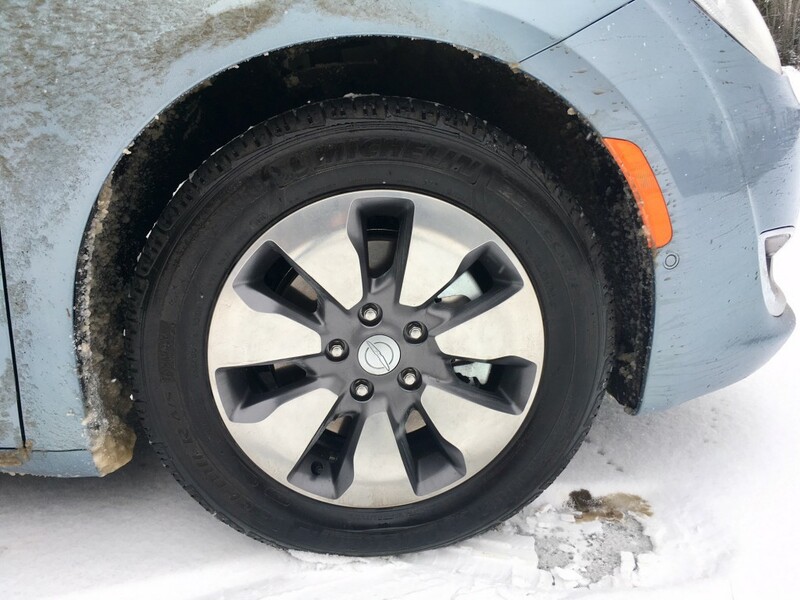 All Pacifica hybrids come with 17-inch alloy wheels, though my tester was fitted with unique and optional 18s. Aside from the wheels, badging on the back and a portal to plug it in over the front fender, there’s really nothing that gives away the fact that you’ve opted to have electricity help out with propulsion of your ultimate family hauler. There’s really no other way of saying it, but the interior is stunning. The design is elegant, modern and fresh from the two-tone leather seats/steering wheel, to the clear and crisp display which houses the still favourable U-connect through an 8.4 inch screen. The system itself has a logical layout and response time is quick. Though simple functions such as activating the heated seats and steering wheel need to be done through different menus and sub menus. A simple button would have been easier. Apple CarPlay and Android Auto capabilities are included. 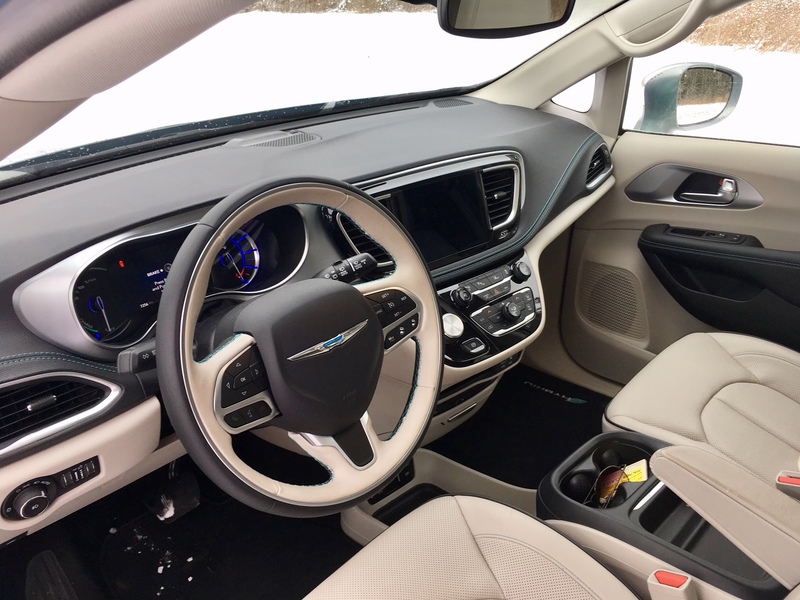 As you might imagine, interior space is excellent though seating is limited to seven people – no Pacifica hybrids come with an eight-seat configuration. That has to do with the battery being located underneath the second row of seats and also is the reason why the second row doesn’t have the stow-n-go feature which allows you to fold the seats neatly into the floor. However, the third row of seats offer stow-n-go and the second row seats can be physically removed if need be. Being a hybrid you may assume that there is little in the form of any interesting power figures under the hood, but you’d be wrong. Instead, the Pacifica hybrid generates a healthy 260 horsepower and 232 pound feet of torque. The end result is a minivan that can certainly hold its own when it comes to acceleration. This will be welcome news for rushed parents who are late driving Junior to hockey practice. 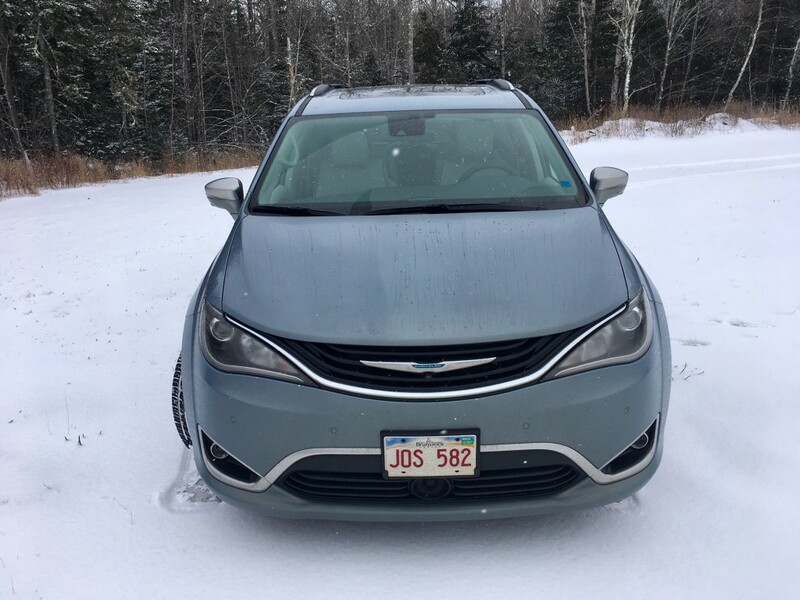 As you might expect, handling isn’t the Pacifica’s forte though the ride itself is comfortable and it remains decently composed overall. My only issue is some creeks and rattles that can be heard inside the cabin. Otherwise the Pacifica is a rather pleasant place to spend time. My tester came completely loaded which means it had a lot of safety tech such as adaptive cruise control, lane keep assist and blind spot monitoring. These were all welcomed features during long trips. Charging the Pacifica is pretty easy to do. You can go to any charging station or you can plug it into any household outlet. If you do the latter, charge time will vary from 12-14 hours for a full charge. This may work out well if you plug it in a couple of hours before bed, but realistically if you buy this vehicle you’ll want to spring for the 240 volt charger which can be installed at your house. This reduces charge time to about two hours. The charger costs around a thousand bucks, though you could likely find one cheaper online. When it’s all charged up and ready to go, you’ll net yourself up to 53 kilometers in all electric driving range. The average commute to work in Canada is about 38 kilometers, meaning you’ll spend the majority of your back and forth commute gas-free. If and when the electric battery is depleted, the gas engine will kick in so that you don’t get completely stuck anywhere. The switch from battery to gas engine is so seamless it’s not noticeable in the slightest. The only way you’d know if the gas engine engaged is to look down at gauges which displays that sort of information. Quite impressive. It all sounds marvelous on paper but in the real world, I didn’t quite experience what I was expecting in terms of fuel consumption. 1) I didn’t often charge it up, in fact I only did so twice. A lot of the times I forgot to do so and was already in bed by the time I remembered and couldn’t be bothered to leave my cozy cocoon. 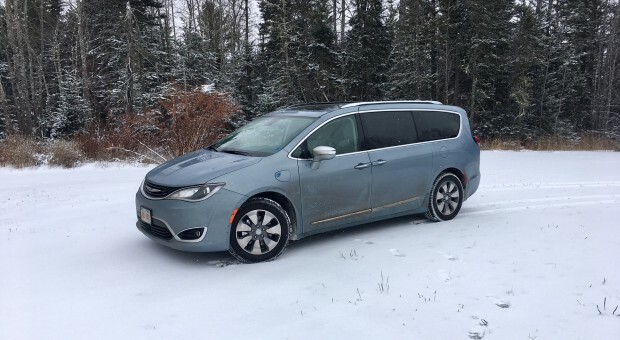 2) Literally every day that I had with the Pacifica hybrid was bitterly cold. I’m talking -10 to -15 Celsius. That kind of weather will take a toll on any vehicle’s fuel consumption. 3) On one of my commutes to work, a five vehicle accident happened about 10 seconds before I pulled up to it. It happened on the off-ramp from the McKay bridge in Halifax so there was no way to go around, or even back up. I and eventually 50 cars or so were stuck. Thankfully no one was hurt in the accident, but since it was -14 at the time, I had to leave the engine running for about a half an hour so I didn’t freeze. After that time the police were able to clear the area and I was on my way again, but I did notice the average fuel consumption rating jump up by 0.3 L/100 kms just due to idling. That’s all a bit of a shame because the Pacifica Hybrid isn’t a cheap vehicle by any means. Coming in at just over 60 grand, you’d expect a vehicle of this price point to deliver on its promises of better fuel economy. You’d also expect a vehicle at this price point to come with larger wheels as standard along with upgraded headlights and brake lights, but no, only halogen lighting is available on the hybrid. 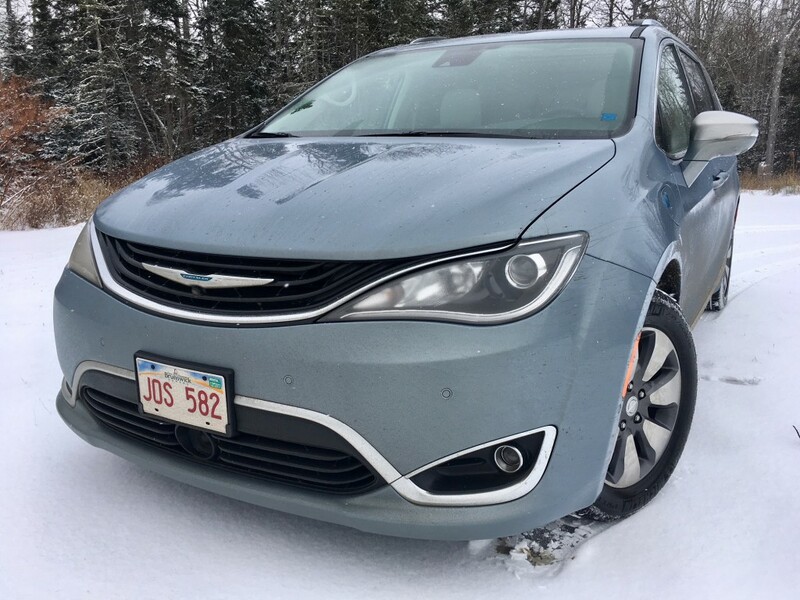 Though the poor fuel consumption showing isn’t 100% the fault of the Pacifica, even with all factors considered, I still would have expected it to perform better in this regard. I would hazard to say it would do better in the other three seasons. But since 95% if Canada experiences snow and bitterly cold temperatures at some point or another, it really does beg the question if it is worth it over the regular Pacifica. Though, depending on where you live, you could get up to $14,000 cash back on a Pacifica hybrid, which changes the equation a bit. Regardless, the Pacifica hybrid is still an impressive feat. It drives well, looks great both inside and out, its operation of the hybrid system is near flawless and in theory it develops excellent gas mileage. 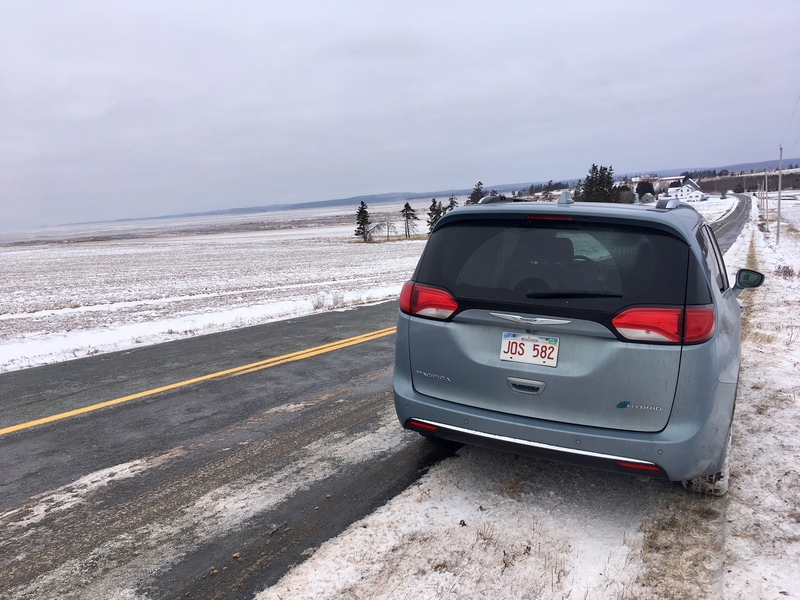 There are certainly some improvements to be made, but for now, the very first hybrid minivan definitely impresses.